In the graphical department, Anton and I discussed the best way to set a rotating chainsaw on fire. We can’t have clusters of them flying through the air with the fire coming out the wrong end – that would just be embarrasing. For some reason there’s also been an increase of frogs in our concept art and games lately. During lunchtime and after work, Anton, Mattias and I play assorted fighting games and argue over the superiority of MK9, SSBM, GG:AC, and MvC3, not to mention arcade sticks vs gamepads. It’s the nerdiest time of day, and I think the more “serious” companies in the corridor wonder if we ever work at all. Every time they walk by our room, I happen to be staring at the screen or stretching my arms (such as right now), which probably doesn’t help. Anyway, developing for the 3DS means a fine balance between interesting use of graphics and plain gimmicks, and in some cases opinions differ. We don’t really “think in 3D” considering that both of our games are 2D, gameplay-wise, so we rather use it as an extra feature. Same with the stylus, it’s just another way to navigate the menues. I may be oldschool, but I think buttons often work best. 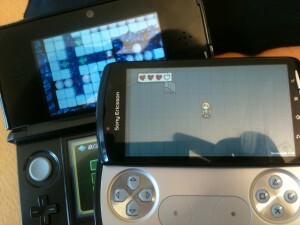 Why did we include an Xperia Play in a 3DS post? That’s it for my introduction – next time I’d like to go more in-depth with one of our games. “Designer” is a fuzzy job title, so I might also just talk about what I do here at Ludosity, and what you can expect if you want to work at a small game studio. We had a very successful launch of our new Play section last week, with our first game Froggish Swimmer drawing fair amounts of attention to itself. We have more titles lined up, expect them to start trickle this week! Also, each game will be accompanied with a “developers statement” that will give some background to how/why the game was made. I think that will be a nice touch – I know I’m interested in other devs reasoning behind their games, so I hope others will be in ours as well. Daniel Remar has the first one up already. We will also start to seriously blog about our main development. We’re currently working with a publisher to bring out two Nintendo 3DS titles this year, but haven’t been able to talk much about it yet (..publishers… =). But now the lid has been lifted, and Daniel Remar will be first out with some ramblings about flaming chainsaws or something. All of you who have bought IndieGamesPack can now have all 6 games redeemed on Desura! There’s a special page for it over at Desura, right here. Two of the games are also redeemable on Steam, our own Bob Came In Pieces, and Azteka! Stay tuned for instructions on how to unlock those. Check out our newly launched Webgames portal and our first game Froggish Swimmer! It’s the first in a string of smaller games that we’ll make available for free. After a bit of live tweaking (sorry about that), we have now taken the first step towards our relaunch of our webpage (and indeed our company)! You’ll notice the new logo, which is slightly tweaked and have dropped the “interactive” part. Also a new section, “Play”, which will soon contain a bunch of free browser games. These games are basically our prototypes for our coming titles. We’ll test the waters by simply putting the prototypes (plus some degree of polish of course) on the webpage for anyone to play. We’re putting a fair deal of resources on our “Prototyping Factory”, so expect many games to come! We are also re-forming our company to a proper stockholding/LLC (the Swedish equivalent), hence the new logo and name (dropping ‘interactive’), and we are taking in some investments which will fund the Prototyping Factory. They add up to a value of $59, so to get them all for $10 is a steal. Check it out now!